The Church is built on a site, ownership of which was the subject of a great struggle between a firm of brewers and the Temperance Movement at the turn of the 20th century. Mr Marshall Jay bought the site to ensure victory for the temperance forces. 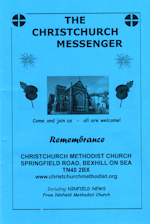 The land was presented to the Primitive Methodist Connection, and with generous financial backing from Mr Jay, plus gifts and labour from members and friends, Christchurch, Springfield Road, was dedicated and opened on 20th March 1907. Christchurch has regular Sunday services each week at 10.30 a.m., and on the third Sunday monthly this is a special Family Service. Holy Communion is celebrated regularly. For details of this month's Services, please read our Services page. We have a prayer chain. Any requests for prayers can be made to Sandy Willard, 01424 215031. Our morning Services are recorded on compact disc. If you are unable to come to a Service, we are very happy to make these recordings available to you on request. Please contact the Senior Steward if you would like to receive a recording. Our monthly magazine tells you all that is going on, and is a good read.